Home / Blog / Brother, Can You Spare a Comment? I’ve been at this blog rather steadily for nine months. My goal is to produce four or five posts per week, and, except for weeks when I’m traveling, I’ve been able to keep that up consistently. The truth is, I really like it. Blogging is fun. And I’m pleased with the results. Visits to the blog continue to grow at a steady pace, and subscriptions to our weekly e-mail update (which comes out on Wednesdays and contains links to the most recent posts) are consistently increasing. That’s a good sign. Of course, I’d love to see our readership grow faster, but I’ve done enough research on such things to know that slow and steady is to be expected. Comments are pretty sparse, however, and I’d like to see that change. My vision for this blog involves not only providing a steady stream of interesting and informative articles about writing, grammar, teaching, and language, but also to create an “online community” where people ask questions and learn from one another. I’m thinking I haven’t done enough to encourage the second part. I often wonder if people are reluctant to post comments on a writing/grammar blog because they are self-conscious about their writing ability or grammar skills. People are always telling me they worry about such things when they speak or write to me. I hate that. I don’t judge such things. The only people I like to pick on are the self-proclaimed grammar experts who arrogantly correct others while making their own faux pas. I don’t correct grammar in daily conversation (well, sometimes with my kids, I do), and I consider blog comments in the same category. Quit worrying; just type. Skip capitals and punctuation. Spell creatively. I don’t care. What you have to say matters more than how you say it. At least around here. I have ideas for future posts — lots of ideas, really. But I would love suggestions from readers. Do you have something you’d like me to talk about here? Some struggle with writing? A homeschooling friend recently shared with me that her daughter has a hard time elaborating with descriptive writing. She gets out a sentence or two, and that’s it — the well runs dry. So, I’m working on a post to help with that issue. Any other ideas? Questions about grammar? Common expressions? I’d also like to know what kinds of articles you appreciate most. I started doing some SAT vocabulary posts, but I found them kind of boring, so I quit. Should I do those again? Do you like the videos? More assignment ideas? Funny stuff? Do you care about etymology stuff (like the O.K. post)? No pressure here — just an invitation. I love that people are reading here. Just know that I’m interested in hearing from you too! Hi Brian, sometimes when I write and edit, it seems to me that the edited version is a hundred times better than the initial one, but sometimes its just the other way round… i am not sure if its just me or does it happen to everyone. Also, is it better to form an elaborate plan before writing or just go with the flow? I’m sure most writers know what it’s like to edit something and end up doing more harm than good. I can’t say that happens to me often though. Usually, I do best if I leave my writing alone for a day or more before editing. I always seem to find better ways to say what I’ve said. As far as creating an elaborate plan — there’s no single right way to do it. Many writers refuse to write anything without a detailed outline or sketch. Others prefer to jump in and let the ideas take them where they will. I would recommend trying different approaches until you find what works best for you. I have just discovered this website through Pinterest. Even if I don’t comment on every one, I am definitely enjoying all of your articles and they have been a BIG help!! Great, Samantha. Thanks for taking the time to comment at all! working under pressure can be good …sometimes…I just go with the flow. or is it sometime….I go with the flow. Minimal time? I’lll be counting sheep tonight. some, minimal, partial,reduced,deducted…not sure about deducted…I know I will be more functional if the heat would come on in my house sometime….when said that way, it doesn’t make sense to me, but it does the other way around…or ways…around…it’s hard to put into words…or..maybe it’s not…I don’t know…just thinking….I can’t type as fast as my rambling thoughts….And can’t type them all, God, I wonder if that’s the same thing? I have to learn to have fun a relax my brain…or do I? sometimes or sometime? ughhh..I did it again! Good to learn though, that’s why I’m here! You did what again? Are you suggesting a post on the difference between sometime and sometimes? It’s a good idea. Am I free to post a site that may be beneficial? I like to think for myself before I look it up, but was searching the difference between sometime and sometimes. 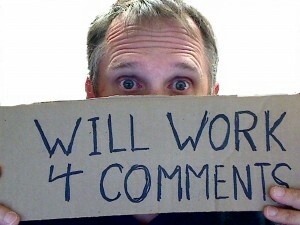 Even thought most if not all blogs allow/ invite comments, most feel like a monologue, so why comment? However, when the reader is invited through inquiries, I have noticed you tend to see many more comments. I think your subject matter and topics are sufficient, just create some open-endedness in your posts. How bout a post on “w00t” – didi you know it’s in the dictionary now? Spelled with the NUMBER 0, or perhaps I should say, digit? Maybe that’s a mathmatical question though, do you multitask? That’s true, C (may I call you C?). I’ll try to do that more–asking open ended questions. It worked fairly well here. I’ll check out the w00t idea. It’s news to me! And yes, I multi-task. I’m chewing gum this very moment! Mz. C for now, I don’t know you that well. I just looked up w00t online, and it did NOT come up as a word. But “woot” did, as of course an interjection etc… but w00t was listed. I think what I may have seen a few years ago was some sort of “honorary” addition at the end of the year, just before New Year’s, so perhaps it was only ceramonially recognized. But you know as well as I do, once you give those rogue words acknowledgement they just take over! I came across your site while doing research for my english project. Grammar is a weak spot for me. I am happy I found your blog. I am happy too. Thanks for the encouraging note! Let me know if you have any particular grammar questions I can help you with. Love the blog! I like all the posts, but my favorites are the writing assignments and prompts and the quotes and tips on writing (like the Dr. Seuss blog post or 29 ways to be creative). I also love the funny posts and the informative posts (grammer usage, etc.) The ones that help me understand writing (Writing and wrestling) or that make me think about it from a different perspective or inspire and excite me to write are also wonderful. Thanks for the great blog! Hi Brian, I like your site and identify with the yearning for comments. It can be painful. I just applied to be a writing coach by emailing you or someone at write-at-home. In one of your videos you said to register, apply, send a sample and take the grammar quiz. Something like that. So I registered but see no application, just a blurb that says to email to inquire. What else. Oh yeah—I can’t find the grammar quiz. It is not on the home page unless I am seriously demented and blind. I would like to take it. Oh here’s another question—what kind of writing samples are we talking about? I have my blog, a published novel and an essay. Just sayin’. No. Kidding. I read that post too. It was good. Thanks for your time! Hi Elise. I received your email and will get back to you with an application when I get back from a trip. I’m in Florida until Monday. Sorry about the delay. You’re not demented. We haven’t launched the Grammar Quiz idea yet. I’m just sort of storing the videos on YouTube for now. I was hoping to finish all of them (10 total) before revealing the quiz. That way, folks could get the explanation for each answer. I may just go ahead and publish the quiz with written explanations and add the videos as they are completed. Sorry for the confusion. And thanks for taking the time to post on the blog! I look forward to talking with you about the possibility of coaching with us. Check. More videos. Done. Do your kids find them funner than my other posts? Well, I for one, per say, vis-a-vis never wuury about having my grammer, like corrected. I can’t hardly beleeve sum of the gramur and speeling errors I see Peeple make; and I’s be really glad for ur blog to help um. Wait. You’re joking, right? Because your comment has LOTS of mistakes in it! Do you ever listen to this American Life? or Mars Hill Audio? They both have some interesting discussions about reading out loud and writing. I really like informational videos where illustrations are used to explain ideas. These are some of my favorite videos. Thanks for the tips, Lydia. I watched the Ira Glass quote video. I’ve read that quote before, but hadn’t seen that version. That kind of animated text accompanying a voice-over is called kinetic typography. I’m fascinated by it and wish I knew how to do it. You’re welcome Isabella. Thanks for the note. You write quite well, by the way. Sure thing, Mimi. I’ve got several planned. Just have to find the time to get them done! That goes both ways, Michael Ann! I am as error-prone as the average guy. I just get lucky more often than not and catch them before readers do.